Ant Control Programs by Envirotrol Pest Management Systems are a 3-Step Process targeting both the Exterior and Interior of the building(s). Ant Control programs involve granular treatments for the perimeter of the building(s). Liquid spraying for the treatment of ants in breezeways and/or building weep holes. Additionally, and most important, is the proper placement of baits around exterior ant mounds and where ants are most likely to enter the building(s). Included in the Envirotrol Ant Control Program is an inspection of your property to thoroughly deduce which pest needs to be controlled and determine where the pest might be. Acrobat Ant - Crematogaster spp. Indoor nest sites may be located where water damage has occurred, in decayed or damp wood, or inside insulating wall panels and wall voids. Outdoor nest sites are usually under rocks or in logs, firewood, or where trees decay allowing them to tunnel under bark or into wood. Workers trail along tree limbs, utility lines, and rails of fences and decks. 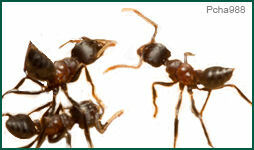 Acrobat Ants often enter structures through cracks and holes around utility lines or pipes, window frames, and soffits. Workers also trail across the ground and floor entering through door thresholds and small openings. Acrobat ants are aggressive when disturbed and give off a strong odor. 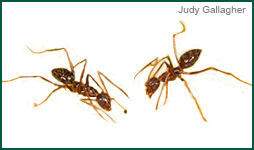 Acrobat Ants eat a wide variety of foods, including sweets and proteins. Workers like honeydew from sap-sucking insects (aphids, mealybugs, scale insects, etc.). 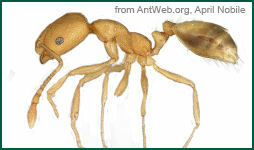 These ants also prey on termite alates and immature stages of cotton boll weevils, grape curculios, and codling moths. ID: This ant has a one node body segment with a sharp, pointed beak. Color ranges from brown to light brown. Uneven, bulbish thorax. 12-segmented antennae, no club. Spaced body hairs. Ant bites and has no stinger. Monomorphic workers (They are all the same size)1/8” or 3.5mm long. Argentine Ants tend to nest in moist areas near a food source. Colony numbers fluctuate seasonally, ranging from one-hundred to several thousand workers and multiple queens. Foraging workers follow chemical trails; winged queens can sometimes be found among them. Argentine ants live outside in shallow nests in moist areas, including under boards and stones, beneath plants, and along sidewalks. Argentine ants will also nest indoors when outdoor conditions are too wet or too dry. Argentine ants invade buildings by trailing along tree and shrub branches, utility lines, and wires. (This is why it is important to keep vegetation from touching the structure. We never recommend vegetation being allowed to touch the exterior of any structure. Argentine ants prefer sweets such as honeydew, fruit juices, and plant secretions, but will also forage on proteins (meats, insects, eggs, fats, etc.) and even attack small vulnerable animals. ID: Black, dark brown, dark red or any combination ofthese colors. One node body segment. Circular ring of hairs at the end of abdomen. Spineless thorax, profile evenly rounded on upper side. Top of abdomen covered with long yellow or white hairs. 12-segmented antennae, no club. Ant bites and has no stinger. Polymorphic workers (they are all different sizes.) 1/4”-1/2” or 7-13mm long. Carpenter ants have moderately sized mature colonies containing more than 3,000 workers with one queen per colony (colonies may contain satellite nests that consist of workers, larvae, and pupae; together with the main colony. The total population may exceed 15,000). Nests usually originate in moist, decayed wood and voids, and may later expand into sound wood. Look for coarse sawdust piles that contain insect body parts and listen for the sound emanating from workers as they chew to remove wood to enlarge the nest. Outside, nests are commonly found in dead or damaged portions of trees, rotting logs, and stumps. Carpenter ants forage alone and along trails 300 feet or more from the nest. “Trunk trails” between parent and satellite nests are clear of vegetation and debris, typically cutting across lawns. Carpenter ants enter buildings around door and window frames, through eaves, along plumbing, utility lines, and over branches touching the structure. Peak foraging occurs at night. Carpenter ants feed primarily on insect honeydew, plants and fruit juices, and insects. Indoors, they feed on food debris such as sweets, eggs, meats, pet food, and grease. ID:Reddish brown coloring with a darker abdomen. 10-segmented antennae, 2-segmented club. Two node body segments. Uneven thorax, no spines, and many hairs on the entire body. Ant is known for its infamous, painful sting. Polymorphic workers (they are all different sizes) ranging 1/16”-1/4” or 2-7mm long. Fire Ants are an invasive species of pests of the southern United States. The red imported fire ant (RIFA) and black imported fire ant have spread to more than 13 southern and western states and are continuing to expand their range. These ants cause serious medical, agricultural, and property damage. The RIFA is very aggressive and will sting repeatedly, especially when their colony/mound is disturbed. Fire Ants typically nest outdoors in sunny areas exposed soil or lawns. If untreated, Fire Ant infestations may reach 30-100 single queen mounds per acre, containing up to 80,000 ants. Over time, colonies may “link”, creating supercolonies of up to 250,000 ants. Mounds are rounded and dome like, ranging froma few inches to several feet across. Each mound has several tunnel just under the soil surface extending out several feet. After rain, nest in sandy soil are rebuilt with sponge-like surfaces. When disturbed, fire ant workers pour out of their mound and aggressively attack the offender. Colonies generally have their own territories. Fire Ants forage in established trails, RIFAs will sometimes nest in areas of exposed soil within buildings (e.g. bath traps). They also build outside nests adjacent to foundation walls and slabs. 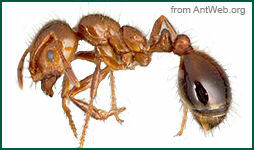 Fire ants are attracted to electrical junction boxes and air conditioning units. They also nest in gas and water meter boxes, and follow pipes buildings. RIFAs prefer high protein foods, but will feed on almost any plant or animal matter. Odorous house ant colonies may contain up to 100,000 ants with many queens. Super-colonies may exist where food, water, and brood are exchanged between satellite locations. Indoors, odorous house ants nest in wall voids, especially around hot-water pipes and heaters, and in crevices around sinks and cupboards. Outdoors, nests are often found soil, usually under objects. Odorous house ants are most likely to enter buildings when colonies become very large and natural food and water sources become scarce and when climate conditions are extreme (drought or flood). When indoors, odorous house ants prefer sweets during most of the warm season, but will eat high protein foods, greasy meats, and cheese as dictated by colony requirements. Outdoors they feed on honeydew, plant secretions, and sometimes seeds and insects. ID: Pale yellow to reddish body with black shading on the top, rear portion of the abdomen. 12-segmented antennae, 3-segmented club (compare to thief ant). Two node body segments. Uneven thorax with no spines. Stinger is present, but is rarely extended and visible. Monomorphic workers (they are all the same size), very small 1/16”-1/12” or 2.0-2.1mm long. Pharaoh Ant colonies range in size from several hundred-thousand workers and several hundred queens to very small colonies with a hundred workers and one or two queens. These ants nest almost anywhere, but prefer warm, humid areas near sources of food and water in wall voids, behind baseboards, in furniture, under floors, and between linens. In southern regions, colonies can exist outdoors. Workers forage widely from the nest and establish visible trails to food and water sources. Pharaoh ants commonly use electrical and telephone wires, plumbing, and other utility lines as trail routes. These ants nest in debris collected on flat roofs, entering and exiting via poorly sealed or defective windows, under flashing, and through weep holes. 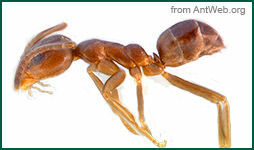 Pharaoh Ants have a wide preference of foods, ranging from syrups to fruits, sweets, meats, pet food, and dead insects. They have a daily water requirement that must be met for survival. Workers forage for water just as aggressively as for food. They will “harvest” water from unusual sources, such as aquariums, pet dishes, condensation on plumbing and windows, refrigerator condensation pans, air conditioners, and house plants. In health care facilities, pharaoh ants have been known to forage on the wounds of immobile patients or residents. ID: Slender, dark brown to black body with gray sheen, luster. One node body segment. Uneven thorax with no spines, profile unevenly rounded. Very long antennae and legs compared to body. 12-segmented antennae, no club. Circular ring of hair at end of abdomen. Monomorphic workers (they are all the same size) 1/16”-1/8” or 2-3.5mm long. Crazy Ants are known for their erratic movements; they appear to be lost and confused. Colonies tend to be small with up to 2,000 workers and 8-40 queens. The presence of numerous continuous interconnected colonies may result in larger infestations. Colonies may spontaneously abandon one nest site and move to another. 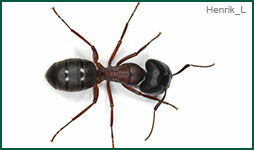 Indoors, Crazy Ants usually nest under floors and in wall voids, frequently near hot-water pipes and heaters. Workers follow trails up to 100 feet to forage for food. Outdoors, nests are shallow and in soil under objects or in plant cavities, trees, trash, refuse, mulch, and potted plants. 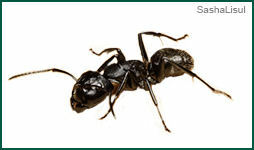 Crazy ants enter homes in the fall or after rain when honeydew supplies are reduced. Crazy Ants prefer insects and sweets, but will feed on any household food. Outside, their preferred diet includes insects, seeds, fruits, and honeydew from aphids, mealybugs, and scale insects.